To use Zaditor in the eye, first, wash your hands. Tilt your head back. Using your index finger, pull the lower eyelid away from the eye to form a pouch. Drop the medicine into the pouch and gently close your eyes. Immediately use your finger to apply pressure to the inside corner of the eyelid for 1 to 2 minutes. Do not blink. Remove excess medicine around your eye with a clean, dry tissue, being careful not to touch your eye. Wash your hands to remove any medicine that may be on them. Zaditor Drops is only for the eye. Do not get it in your nose or mouth. Do not wear contact lenses if your eye is red. Do not use Zaditor Drops to treat irritation caused by contact lenses. Remove contact lenses before you use Zaditor Drops; soft contact lenses may be placed back in the eyes 10 minutes after use of Zaditor Drops if your eyes are not red. 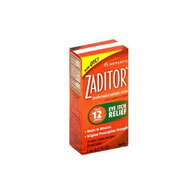 Zaditor is an antihistamine and mast cell stabilizer. It works by blocking the release of chemicals from cells involved in allergic reactions. Some MEDICINES MAY INTERACT with Zaditor Drops. However, no specific interactions with Zaditor Drops are known at this time.